One of the world’s most popular coffee brands. Available in many varieties to suit all tastes and occasions. 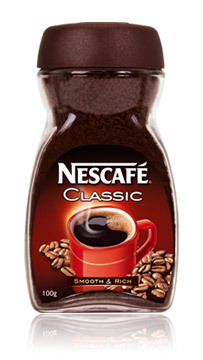 FromNescafé Classic to our newer well-being products such as Greenblend with higher levels of antioxidants. The rich taste of your favourite coffee reflects its rich history. Nescafé coffee originated in Brazil in the 1930s as an early example of innovation and sustainable development. Building on Nestlé’s milk processing expertise, we developed soluble coffee helping thousands of Brazilian farmers avoid hardship and crop waste. True to our heritage, we continue to support and work with farmers around the world. Having developed a way to make a quality cup of coffee simply by adding boiling water, Nescafé coffee was launched in Switzerland in 1938. It was soon exported to France, the UK and the USA. In 1965 Nescafé brand extended its innovation by offering freeze-dried soluble coffee with the launch of Gold Blend. Over the years,Nescafé product innovation has evolved further to capture even more of the natural aroma and flavour from every coffee bean. Today consumers around the word enjoy the quality, flavour, aroma, convenience and natural goodness of Nescafé coffee in many different formats.